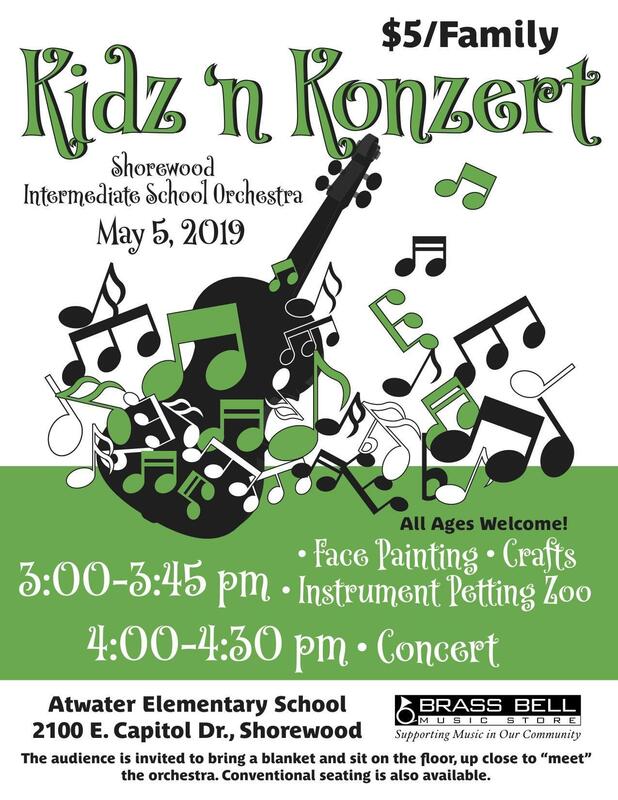 SIS Orchestra Presents Family-Friendly "Kidz 'n Konzert"
The Shorewood Intermediate School and Brass Bell Music Store present “Kidz ‘n Konzert”, a family-friendly event at Atwater Elementary School at 2100 E. Capitol Dr. in Shorewood on Sunday, May 5, 2019. The event is open to all ages and the general public. Pre-concert activities start at 3 PM and include crafts, face painting, and an instrument “petting zoo” in which children can see, touch, play and hear string instruments including violins, violas, cellos and basses. The Shorewood Intermediate School’s 100 orchestra students will perform at 4pm. These seventh- and eighth-graders will entertain with a mix of classical and popular music, including music from Disney’s “Moana”,“Spring” by Vivaldi, and Irish fiddle music. The audience is invited to bring a blanket to sit on the floor, up close, to “meet” the student orchestra. Conventional seating will also be available. Admission is $5/family, and tickets will be available at the door.